ORIS is announcing six watches at Baselworld for 2019, but of those six, this one really captures my attention. This is the ORIS CLEAN OCEAN LIMITED EDITION, a part of ORIS’s campaign to clean up the the world’s oceans. 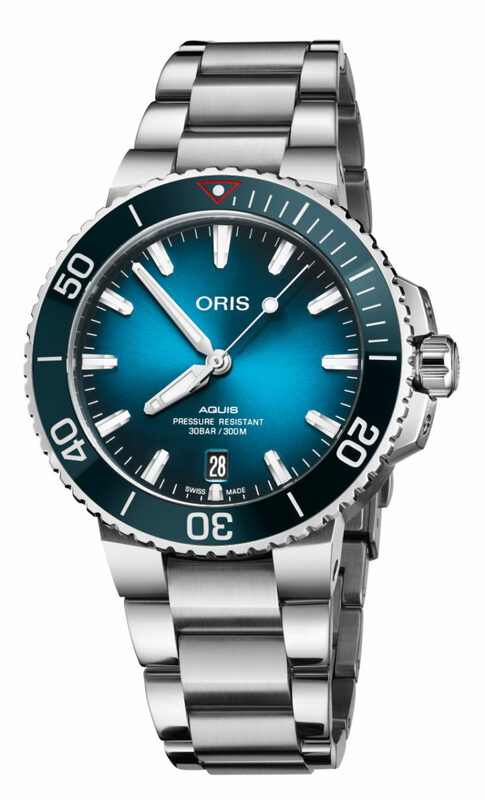 Sure, you say, “ORIS is just trying to capitalize on some clean-ocean-feel-good nonsense,” But you’d be wrong. ORIS has partnered with various marine conservation organizations over the years, and adopted the 17 UN Sustainable Development Goals as company policy. And now, they’re partnering with Pacific Garbage Screening, who are attempting to capture plastic before it enters the ocean. The Pacific Garbage Screener is a floating platform anchored in position that disrupts and calms ocean currents, causing plastics to float to the top. There are an estimated 700 tons of plastic entering the oceans every hour. To mark ORIS’s support of Pacific Garbage Screener, the limited edition CLEAN OCEAN watch has a little medallion of recycled PET plastic embedded in the case back. The watch is a svelte 39.5mm diameter, which I love, and the dial is an ocean-appropriate aqua blue. The bezel insert is a matching aqua blue ceramic insert with classic red triangle at the 12 position. The stainless steel watch is powered by ORIS’s 735 calibre, based on the Sellita SW-200 with the date at the 6 position.